BullGuard Internet Security Review – BullGuard hasn’t had a very good time of it in our recent tests, and we’re sad to say that this year hasn’t seen things improve at all. In fact, BullGuard Internet Security has done exceptionally poorly With a total accuracy score of 88%, BullGuard Internet Security comes above only Windows Defender in this test. Since Windows Defender is something that we refer to as baseline protection only, that’s not good. To put this in perspective, every other bit of free software, and every other paid-for suite did better than BullGuard in our tests. Drilling down into the results to find out where things went wrong, it soon became clear. Looking at the protection accuracy rating, BullGuard scored just 75%. While BullGuard Internet Security correctly detected 96 out of 100 threats, it blocked only 85, neutralised a further eight and let seven bits of malware through. Again, only Windows Defender’s poor protection let more through. When it came to legitimate software, an accuracy rating of 96% puts BullGuard near the bottom of the table, too. Overall, it’s not a great result from this anti-virus company this year. 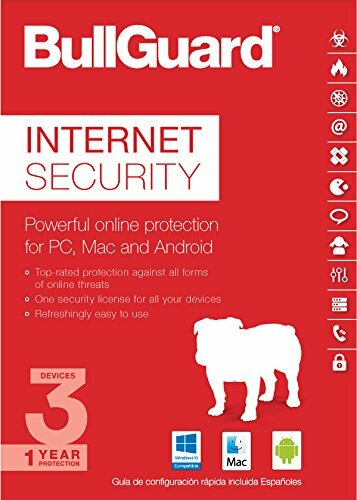 We decided to review Internet Security, as it’s the best-value package, currently on sale for three devices. The Premium Protection, which is a lot more to pay. The subscription covers multiple devices, which BullGuard says is for all of your equipment: PC, Mac and Android. The protection is a shame, as the software is one of the easiest-to-use applications. The main screen is split into seven clearly labelled sections. Each section has a primary action (such as Quick scan for the Antivirus menu) and then a menu of secondary options (such as Full Scan and Scan Folder), making it easy to find the tools you’ll use most often. and other known vulnerabilities, and cleans up what it perceives as junk files. BullGuard is set to enable background PC optimisations. These automatically clean browser caches, and delete log, memory dump and crash dump files. These are features that we believe should only be enabled by a user and should not be the default setting. BullGuard has all the parental controls you’d expect from a security package. You can block broad website categories, as well as specific URLs. 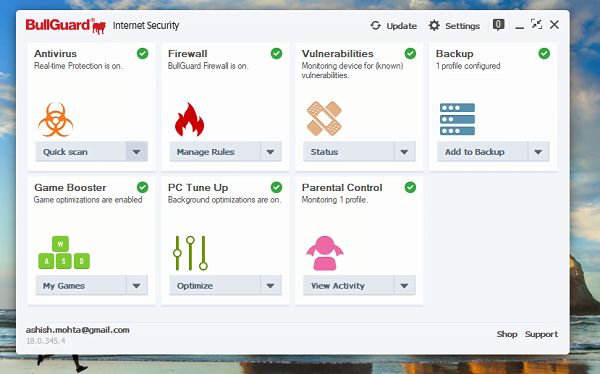 BullGuard has a set of presets for different child ages, unblocking more categories for older children. There’s an easy-to-use scheduling tool that lets you schedule hours during which your children are allowed to use the internet and the PC itself. You can also block specific applications, although these are blanket blocks that are always active, instead of timed. You can also stop the transmission of specific number and text strings, such as credit card numbers. All of this information has to be entered manually, so it’s quite a laborious job to get it all done. Game Booster works on systems with four or more cores, automatically detecting when a game is playing, and reducing BullGuard’s resource usage, so you don’t get any slowdown. This could be a neat feature, but it would be nice to see a traditional game mode, where popups are suppressed, so that your gaming session isn’t interrupted. There’s a built-in backup utility, and the destination can be set as Dropbox, Google Drive, OneDrive or an external HDD/NAS. However, if you’re using any of the former cloud services, you may as well install the client software and make sure that all your important files are stored there. This is far more convenient than relying on BullGuard. Ultimately, despite the competitive pricing and simple interface, BullGuard didn’t do well enough in this round of tests for us to recommend it. Instead, we recommend using Kaspersky Security Cloud, which topped the table and gave us the best overall protection score in this year’s test.